A boycott of communities located beyond the 1949 Armistice Lines will hurt peace, explain Prime Minister and Justice Minister. 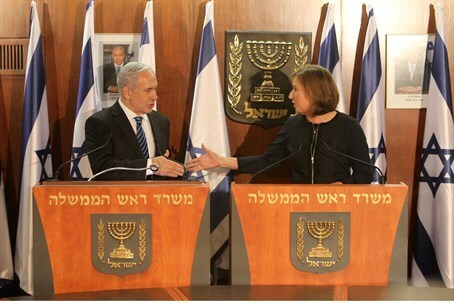 Prime Minister Binyamin Netanyahu and Justice Minister Tzipi Livni spoke with officials in the European Union on Wednesday, explaining to them that the EU’s boycott of communities located beyond the 1949 Armistice Line will negatively affect the efforts to achieve peace. Netanyahu spoke with the president of the European Commission, Jose Manuel Barroso, asking him to postpone the publication of the new guidelines forbidding EU member states from cooperating, transferring funds, giving scholarships or research grants to bodies in Judea and Samaria, eastern Jerusalem, and even the Golan Heights. Netanyahu told Barroso that publishing the guidelines on Friday would hinder U.S. efforts to restart the peace process with the Palestinian Authority. Livni, who is the minister in charge of peace negotiations, spoke on the telephone with the EU’s Foreign Policy Chief Catherine Ashton, asking her to postpone the official publication of the new guidelines, citing efforts to restart the peace talks. Netanyahu has reportedly discussed the new EU guidelines with many European leaders since they were made public on Tuesday. He has spoken with French President Francois Hollande, Greek Prime Minister Antonis Samaras, Maltese Prime Minister Joseph Muscat and Austrian Chancellor Werner Faymann. Netanyahu also spoke with U.S. Secretary of State John Kerry, who is in neighboring Jordan on his latest bid to revive direct negotiations, telling him that the EU was "damaging efforts to restart the talks." Netanyahu said Tuesday in an initial reaction to the EU boycott: "We will not accept any external dictates regarding our borders," he said, adding that “the issue will be decided only in direct negotiations” between Israel and the Palestinian Authority. Yisrael Beytenu chairman MK Avigdor Lieberman joined Netanyahu and Livni in warning that the EU boycott would harm peace efforts. "If the EU intention is realized it will be a lethal blow to the chances of renewing the peace process, that the Europeans are so interested in," Lieberman wrote on his Facebook page.